At MDM we’re forever inspired by the many dancers we know (and the millions more we don’t) and feel connected with as part of our shared dance community. Just as they strive to be better each class and each day, so do we. As most of you are already aware MDM’s Intrinsic Profile, released at the beginning of 2018, quickly became one of our most successful products. As with any new products there are bound to be a few tweaks required once your feedback comes in, so even though it's been a tremendous success, we have taken on board your feedback to ensure it’s even better. With an excitingly re-engineered Dance Base Support that is even more beautiful while offering enhanced levels of comfort and support, we are sure you will love these new updates! You'll notice that the Dance Base Support has been widened ever so slightly as it reaches the front sole. This change will reduce twisting, a problem commonly found in ballet shoes made from stretch materials. Some dancers may have also experienced a slight, yet noticeable puckering effect when in the fully pointed position with the current Profile and so this change for the 2.0, will also help to improve the aesthetics when in a tendu position as seen below. The relationship between the dancer's foot and the floor is critical to feeling secure and there are various surfaces that dancers work on. It’s been concluded that on some surfaces our current Profile version can feel a little stickier than “normal”. While most have experienced that this stickiness reduces over time, it’s something we wanted to address. The Profile 2.0 still offers enhanced levels of comfort, support and an improved connection between the foot and the shoe during pirouettes. A very significant benefit from the new outsole is that it has been possible to make the pleats flatter, allowing the dancer to feel more connected to floor and to find a more comfortable position on demi-pointe. 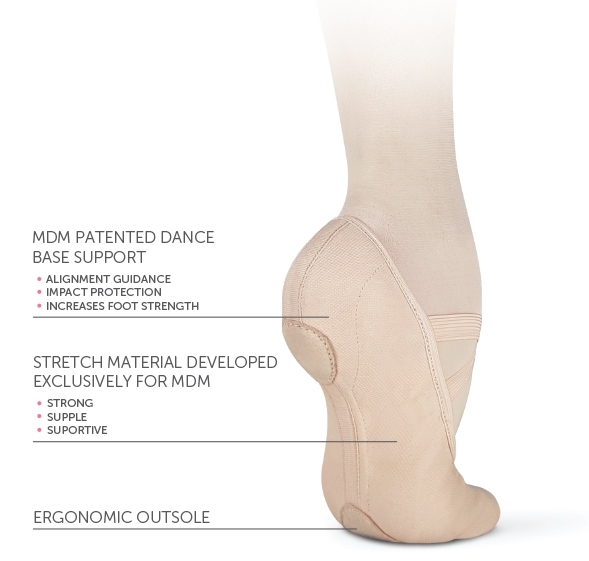 Therefore the Profile 2.0 whilst still offering the enhanced levels of comfort and support also gives an improved connection between the foot and the shoe during pirouettes by reducing the twisting feeling often felt in a stretch canvas shoe. We know, nothing matters more than the young and their future. And it’s because of this that MDM exists. Thinking long term about young dancers and how they will feel in 5 years, 10 years and beyond is at the beating heart of why we do what we do; why we’ve developed our designs and why we’re working to build and grow this exciting company and brand. Because we want you, dancers and parents of dancers, to have real choices: so now you can choose between what’s always been done, or how it can be done better. That’s the choice MDM provides and the statement the MDM brand makes.